B.C. Carbon Tax Backlash: How Real? For months we’ve been touting the British Columbia carbon tax, and for good reason. Not only is BC’s carbon tax the highest by far in North America ($10 per metric ton of CO2 this year, rising stepwise to $30 in 2012), but the rollout of the tax has seemed to be handled with great intelligence. The Liberal Party provincial administration took pains to make the tax revenue-neutral (mostly via reductions in personal and business tax rates), a feature it underscored by sending B.C. residents $100 carbon tax dividend checks as a down payment in the week before the tax went into effect on July 1. So we were dismayed to read in mid-July of a poll showing a clear majority of B.C.’ers opposed to the tax. Even the $100 dividends came off badly in the poll, with at least one respondent complaining that her check only served to remind her of the loathsome tax. Columnist Bill Tieleman, who posted the story on the Vancouver Web outlet 24 hours, drives home the point in a later story, Carbon tax has no supporters around here. Tieleman seems to fancy himself as a populist voice against B.C. premier Gordon Campbell in general and the tax in particular. 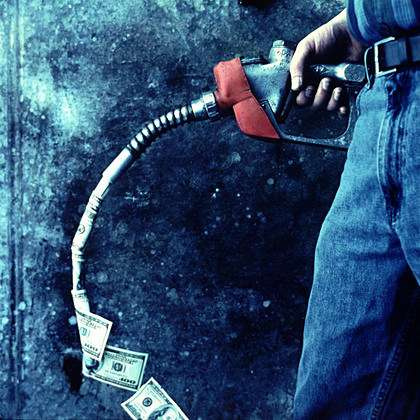 Much is made of Americans’ supposed sensitivity to gasoline prices, and the same may be applying in B.C., exacerbated of course by the "market-based" rise in pump prices which has been an order of magnitude greater than the (9 cent a gallon) carbon tax. Mathematically, each of those $100 checks covers the carbon tax on 1,111 gallons, though the true coverage is less considering that gasoline accounts for only ~35% of the carbon tax bite in BC (21-22% in the U.S.). Needless to say, most BC’ers don’t consume 1,100 gallons of gas a year. Most likely the BC government could have done more and better p.r. Yet overall they’ve been savvy … consider if the $100 checks had lagged rather than preceded the rollout of the tax! be paid for by B.C.’s new carbon tax of 2.4 cents per litre of gasoline and other fuel. Do you agree or disagree with this expenditure?" One always wants to know how the poll respondents were selected. (Recall the notorious Literary Digest poll picking Landon over FDR in ’36!) Still, this isn’t to deny that even the dividend concept which you’ve been so prolific and persuasive in disseminating is an uphill fight. One problem (from a PR standpoint) might be that the BC tax cuts are divided between individuals and businesses. So even if there is overall revenue neutrality, most voters will only get back about half of what they pay in higher prices. The way in which tax cuts rise along with carbon prices is not transparent or seemingly automatic. The carbon tax revenue is not placed in a separate trust fund (so far as I can tell) but is blended with general revenue. It is then up to future legislatures to adjust the tax rates. This could reasonably make people skeptical. A one-time dividend is an obvious gimmick. Recurring (and rising) dividends are likely to create more credibility. This goes to the heart of the question of whether to return carbon revenue via tax credits or dividends, which is something Obama will have to decide. Peter concludes: "The British Columbia experience suggests that segregating carbon revenue in a trust fund and returning all of it to individuals through automatic monthly dividends (as James Hansen and others have proposed) is the best way to sustain political support." We at CTC heartily agree. One has to be skeptical of polling data that can’t be accessed, let alone verified. And this early in the program, popularity assessments shouldn’t be taken too seriously anyway. In addition to deciding where carbon revenue goes (as Barnes suggests), I hope the next president and Congress are also moved to consider the advantages of a carbon tax. Revenue-neutrality ("cap-and-dividend") would fix only one of the four major flaws of cap-and-trade. * The creation of a new currency in the form of tradeable permits which would facilitiate illegal activity such as arms trading, drug trafficking and terrorism. Trying to fix "cap-and-trade" seems like trying to patch an inner tube with four gaping holes in it. Time for a fresh start. A carbon tax starts without the fatally large flaws of cap-and-trade that are all emerging as the EU struggles mighty to implement it. Bush’s obstinante stalling on the climate crisis has ironically bought the U.S. the opportunity to learn from the collossal failure of the EU’s cap-and-trade system to acheive any net reductions. British Columbia has done something we haven’t: they’ve moved past the fearsome name ("carbon tax") and are grappling with the substance. A trend of emissions reductions should give them a lot more to talk about when the pollsters call a year from now. On his GPS show last week, Fareed Zakaria asked viewers what their favorite alternate energy would be. This week he told us his favorite was "American ingenuity". Nothing brings out American ingenuity as much as tax avoidance. People tend to leave engineering to engineers and (not as much as I’dlike) science to scientists, but all Americans: special creationists and darwinists, bleeding-heard liberals and rock-ribbed conservatives, etc. and not just tax accountants thrill at the chance to cut THEIR OWN taxes. Nothing would release the floodgates for American ingenuity like the carbon tax. But getting started is the issue. Let us pray for success in BC. Separately, I can’t help feeling that people’s objection to the carbon tax is a resentment at having to give up cheap fuel and the lifestyles it makes possible. To a large extent, I suspect that the desire for alternate sources of energy is like the desire for "safe cigarettes" back when I was considerably younger. Full disclosure: although I eventually did quit, and I feel far better for it, I still resent having to kiss goodbye to what I enjoyed for so long. As to your points, every poll save one national poll done for the environmental group the Pembina Institute has shown strong opposition to the carbon tax. The Vancouver Sun reported an Ipsos-Reid poll back in June that showed 59% opposed the tax, following an earlier March Ipsos poll that had 61% saying the carbon tax was a "bad" idea. The reality in BC is that people do not support the carbon or gas tax. A carbon tax? We all knew this was coming. Tax people more so government will have more to waste to enrich their friends and stay in office.Liberalism is truly a mental disorder!Oh, and while we "little people" pay the tax and ride our bikes or walk to work, the political and business elites will continue to ride in black Suburbans and fly in private jets.Did you know that Nancy Pelosi and other "dignitaries" flew to Montana on 7/25 to attend San Francisco mayor Newsome’s wedding? They got their in the Google Corp. jet — a 757 with 7 "livingrooms". Check the story on SFGate.com. Written by another "dignitary on the plane" Willie Brown — millionaire former mayor of San Francisco.Are you people that stupid to want to tax this country into oblivion so we can while our politicians and corp elites continue to waste resources on their lavish lifestyles?I’ve got no problem if wealthy people want to fly private or drive Hummers. That’s their business. But our politicians who are "public servants" and work for us? I don’t think so.I feel a classic French Revolution coming down the pipe.Global Warming? You people are nuts. It’s worth noting that the BC Liberal party is actually the right-of-centre party in BC, and the left-leaning opposition NDP has traditionally captured more of the green vote than the Liberals. The Liberal party introduced very large tax income and business tax cuts in their first term, which the NDP opposed. One has the impression that the NDP has lost their ideals and that the Liberal party is actually the one better positioned for the election next spring, despite grumbling about the carbon tax.It’s disheartening that the carbon tax is not popular but, fortunately, the Liberal party appears to be rock-solid committed to it and they’re likely to remain in government to see it through. I realize you’re proponents of the tax, but questioning the polls comes off as pretty pathetic wishful thinking. My very anecdotal evidence suggests that, if anything, the poll may actually understate it. Part of this is, of course, because taxpayers usually don’t believe the phrase "revenue neutral". Even if true (which I am pretty skeptical of), it’s only statistically so. I live out in the country, about three miles or so from the nearest grocery store. The carbon tax will not be revenue neutral for me. For people living in truly rural areas, such as in the Peace River, the tax will likely be downright regressive.At the end of the day, BC is a government of the people, by the people and for the people. If there is this much discontentment to the legislation, then the Liberals had better figure out a way to convince not only rural British Columbians, but apparently a heck of lot of folks in larger urban areas (which appears to be their power base) that this is a good idea. To my mind, the first start would be to start making industry pay its far share. Secondly, as the Federal Liberal’s plan suggests, rural residents should see a bit of a break. We rural citizens are a rather important part of the province’s economy, and are being unfairly targeted in what the Finance Minister dismissed in an interview a couple of months ago as merely being "lifestyle choices". In the end, the BC Liberals have until about the end of February 2009 (when I usually do my taxes) to show me that it hasn’t cost me a dime. If I calculate that it has, they’ve lost my vote. BCDan: the income tax cuts will (eventually) mean lower labour costs. And that includes costs incurred by other government levels. I therefore challenge your assertion that other levels of government will have to raise their taxes. Regarding the polls, there are lot of reasons to disapprove of the $100 dividend cheque. It is an obvious gimmick. But that’s not the same thing as disagreeing with the carbon tax shift. There’s not really any "belief" required (unless one believes the income tax revenue figures reported in the budget are bogus – even though they must surely be readily verifiable by any opposition MLA). The thing to remember, also, is that the opposition party (the NDP) are also in favour of a carbon tax (I heard it straight from their leader when I ran into her on the ferry). Everyone’s having a good time with their "axe the tax" mantra right now. But come election time, when the rubber hits the road and people start to actually look at the issues, I think the NDP is going to have a hard time really differentiating their Climate Change plan from the Liberals’. So I would be surprised if the anger people are feeling (let’s be honest, it originates from the "market-based" rise in gasoline prices, not the carbon tax) actually translates significantly into electoral activity. As noted above the BC carbon tax is revenue neutral to the government but not to individual taxpayers, creating something that works for everyone would be an impossible task. The "unfairness" of the BC approach with respect to natural gas use is that those who can most afford to use fossil based fuels will continue to use fossil based fuels regardless of the current tax structure. What is needed is a tax structure providing the incentive for all residential users to reduce usage. BC Hydro has, under approval of the BC Government, developed an inovative tiered residential rate structure for electricity based on average residential usage. The concept is that those using at or below the average residential number of KWH pay less per KWH while all KWH above the average are billed at a higher rate. Reduce your residential usage and reduce your monthly bills. The BC carbon tax, as applied to natural gas, is a flat rate of about $0.50 per Giga-joule. Assuming the average residential usage to be 70Gj per year, the current BC carbon tax would add about $35 annually. Although a residence that uses four times the average (heated pools and hot tubs, large buildings with poor insulation etc…) will pay four times the carbon tax, the question remains: Because I can afford to, do I have the right to create a larger carbon footprint? Why not have a tiered rate structure similar to BC Hydro? Is this for real? I almost laugh every time i hear these proposals. If you think any tax has ever fixed any problem, just look at almost all government’s records. As far as spending this tax on alternatives, how much will they waste on the programs the lobbyists will be pushing for. How much of it will get spent on things not relating to energy whatsoever. As for buying and selling of Carbon credits, i think that is an even worse proposal, can you imagine a man like Boone T Pickens Buying up a large amount, what that would do to the us and the world. If your still in the global warming camp, you had better sit down, and make sure you really buy this BS that the UN is feeding you. DO the research, the proof is inconclusive at best. Al gore’s movie is full of fallacy and flat out lies (especially the cuddly Polar bears). Miller: BC Hydro’s multi-tiered rate structure is also just a price signal, and so can also hypothetically be ignored by rich people. It is identical to the carbon tax in this regard. However, price signals matter, even for rich people: when there is a choice between two alternatives, the non-carbon one will be get a leg up. Rich people generally do not use "can I afford to" as the defining criteria for a purchase decision. They are not limitted by cash flow. They ask instead "is it worth it?". BC Hydro’s tiered price is different from carbon taxes in terms of implementation costs, though. Bills are going to get confusing. And they will have to actually measure the meter every time (they can’t do what they’ve done in the past which is over-bill one month and under-bill the next to balance it out.. because now the price curve is nonlinear). It’s also a bit too reminiscent of central planning (providing guidelines for how much eletricity a house "should" or "should not" consume). Every kWh of electricity costs BC Hydro the same amount, requires the same capital investment, and causes the same amount of environmental disruption as any other kWh. Yet for some reason they are differentiating. It’s strange that they are implementing a nonlinear price curve. All they are going to do is discourage things like heat pumps, and subsidize an "average" home full of incandescent lights. Jeremy: yes, cap-and-trade is an aweful system. Write your congressman today to tell him you prefer carbon taxes to cap-and-trade. You’re going to be getting one or the other, whether you personally believe in climate change or not. This is not revenue neutral to any suppliers outside of BC. You are stuck paying for a tax to the Transportation Provider, which becomes a cost, which is marked up as a cost input, then passed back to the BC client in the form of a higher landed cost of the goods with markup. It should be abandoned given the current economy and re-thought.